Bengaluru: Infosys Ltd managed to grow its revenue in the December quarter (Q3) at a faster pace than its larger rival, Tata Consultancy Services Ltd (TCS), the Bengaluru-based company said on Friday as it offered to pay shareholders ₹ 8,260 crore through a share buyback, the second successive repurchase in as many years. Significantly, Infosys raised its full-year revenue outlook to 8.5-9% in constant currency terms from the earlier 6-8%, though the company’s profitability took a hit, after Mumbai-based TCS too saw a contraction in operating margin. The Infosys board on Friday approved a share buyback for up to ₹800 a piece, which will cost the company around R 8,260 crore. This is the second share buyback after the company returned ₹ 13,000 crore through its first share buyback completed in December 2017. Infosys also declared a special dividend of ₹4 per equity share and fixed 25 January as the record date for the special dividend and 28 January as the payment date. In constant currency terms, Infosys’s Q3 revenue rose 2.7% from the preceding three months. Currency fluctuations, however, took some sheen off the company’s growth as dollar revenue increased at a slower pace of 2.2% to $2.98 billion in the quarter ended 31 December. “With increased client relevance, we saw double digit (10.1%) year-on-year growth in Q3 on a constant currency basis," said Salil Parekh, managing director and chief executive officer of Infosys. “We also had another strong quarter in our digital business with 33.1% growth and large deals at $1.57 billion which gives us confidence entering 2019," he said. TCS, which declared its Q3 results on Thursday, reported a 1.8% sequential rise in revenue in constant currency terms and 0.67% increase in dollar terms. 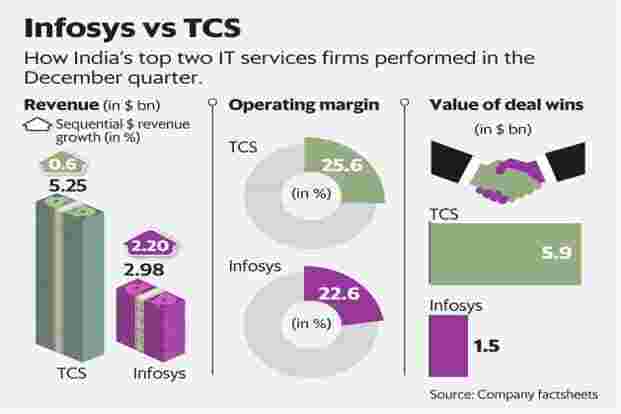 However, year-on-year, TCS’s 12.1% revenue growth in constant currency terms and 9.7% dollar revenue growth is higher than Infosys’s 10.1% constant currency and 8.4% dollar revenue growth. Infosys’s net profit declined 29.6% to ₹3,610 crore for the third quarter ended 31 December, against ₹5,129 crore in the same period a year ago. Operating margin stood at 22.6%, 110 basis points narrower than the 23.7% in the July-September period. A Bloomberg survey of 20 analysts had estimated a net profit of ₹4,151.6 crore ($596.92 million) on net sales of ₹21,294 crore ($3.05 billion). Parekh, who has completed a year as Infosys CEO after taking over the position as the second non-founder of Infosys in January 2018, assuaged concerns of risks related with macroeconomic slowdown in the financial year beginning April. “I’m delighted at the way the year has gone off," he said. “Infosys surprises positively with strong top-line growth for the quarter, though margin performance misses the mark. Increase in revenue guidance and better exit rate for FY19, provides comfort on double digit growth in FY20. Buyback quantum seems to be below expectation. However, it will support the stock performance in medium term," said Sanjeev Hota, an analyst at brokerage Sharekhan Ltd.
Encouragingly for the company, Infosys won deals worth more than $1.5 billion in the quarter, taking the total value of deals won by the company during the nine months of the financial year to $4.7 billion. Clients from the financial services space, which contributed a third of Infosys’s revenue in the latest quarter, and customers from Europe, who accounted for a fourth of the company’s business, grew 3% and 2.9%, respectively, higher than overall growth. Still, there were a few wrinkles in what was otherwise a decent performance. First, in addition to the decline in profitability, was the management’s decision to abandon its plan of selling Panaya, the automation firm, and Skava, the mobile e-commerce firm. Infosys under earlier CEO Vishal Sikka had spent $370 million to buy the two firms. Last year, Infosys decided to put the two companies on the block, after discounting 59% from the fair value of Panaya. Now Infosys will make investments in the two companies and sell its solutions along with its other offerings. Second, attrition rates at the company continue to be high compared to its rivals. The attrition rate at the IT services business of Infosys was 17.8%, 210 basis points lower than the 19.9% at the end of September quarter. On Friday, Infosys shares rose 0.58%, or ₹3.95, to R 683.70 apiece on the BSE while the benchmark Sensex fell 0.27%, or 96.66 points, to end the day at 36,009.84. Infosys Q3 results were announced after market hours.